Upon taking a step back from the map, I saw that there were countless islands in the Seto Inland Sea facing Fukuyama. Shodoshima, Teshima, Naoshima, Innoshima, Ikuchijiima... I tried to find some islands whose names I’ve heard. When took a closer to see which of them seemed reachable from Fukuyama, several islands popped up whose names was seeing for the first time. One of them was called Momoshima. It was a bit more compact than those islands with which I was familiar. There are theories that the island’s name originates in how it had many peach trees (“momo” is Japanese for “peach”) long ago and was thus at written using the character for peach, but at some point the character for “hundred” began to be used instead. What was on this island, and what sort of people lived there? 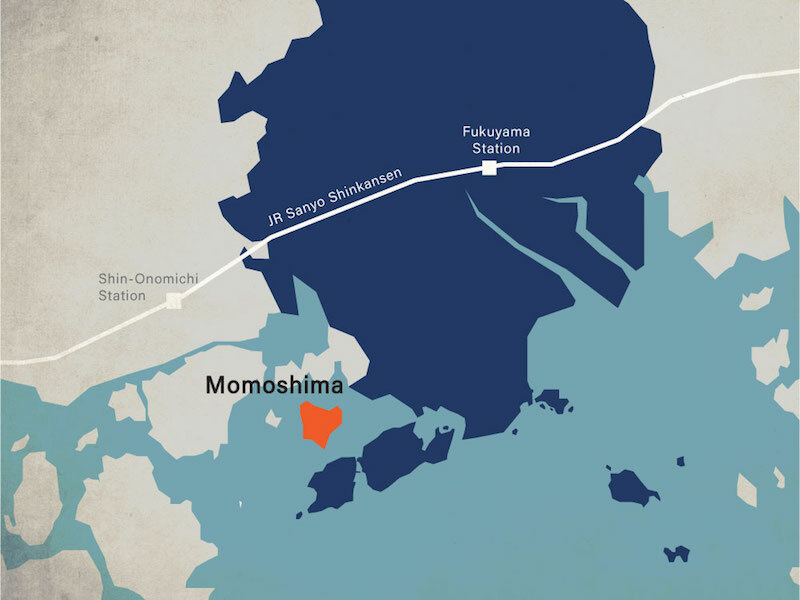 Ride the bus from Fushimicho towards Tsuneishi Harbor and you’ll find a boat that crosses to Momoshima. Though the island doesn’t appear even in magazine features put together about Setouchi, it is quite close to Fukuyama. Going along with my impulse to know it for myself, I decided to go there. The ferry “Momokaze” came to pick me up when I arrived at Tsuneishi Harbor. It’s paint job was cute, making for a pleasant beginning to my trip. My voyage aboard the Momokaze lasted a mere 10 minutes. I was let off on the island before I knew it. With no plans or people to meet, I simply followed the winding roads. The current population of this island that just around 12km in circumference is 474 people. It’s especially rare to encounter anyone on days with sprinkling rain like when I visited. Roads that go up and down, small fields, tiny bus stops, and weathered houses. Just an hour and some change taking a bus and a boat from Fushimicho. The scenery and flow of time on this compact island that lives on farming and fishing is something completely different. As I wandered around the village, I found a shop with the mysterious sign “Jii-chama Club” (“Grampa Club”). It took a bit of courage to open the door given the look of the place, but I decided to go for it, thinking, “Well, I did travel here”. I opened the door. Unsurprisingly, there was an old man standing in front of the griddle, and I thought “I guess that’s what they meant” as I took a seat. The old fellow apparently used to work as a dispatch cook for Japanese cuisine, then moved to Momoshima one his own upon reaching retirement age after launching eateries and working as a chef in various locales. This business is one he opened after remodeling a vacant house. I was stunned to hear him claim that this is the only restaurant on the island. Places to eat out on this tiny island apparently grew fewer in number as time passed and its population shrank. He told me that I was lucky to have found this place unknowingly. There is no menu; tell him how much you can spend and what you’d like to eat and he’ll make it for you. I decided to order okonomiyaki and a beer for starters. Customers can also bring their own spirits and ingredients. There are even people who come in with fish they’ve caught and ask him to clean and gut it. The old man then uses it to prepare a meal. That’s how he decided he was going to do things on this island. He tells me that at present the island is home to this one restaurant, its first ever bakery, an art space set up in a former school, and then activities like canoeing and pottery workshops. And then, on that very day Nishino-san, the island’s lone figure engaged in natural cultivation, came by the restaurant. He had ventured to various countries and then moved to Momoshima upon getting married as his grandmother was from there. A stalwart traveler, he apparently met his wife while on a trip to India. The Nishino family has a first son, and with there being so few children on the island he apparently gets doted on by the many elderly men and women here as if he were their own grandchild despite not being a blood relation. “I’m about to go slaughter some chickens, but would you like to join me?” asked Nishino-san. I’d never been invited to go slaughter chickens, but I made up my mind to tag along. 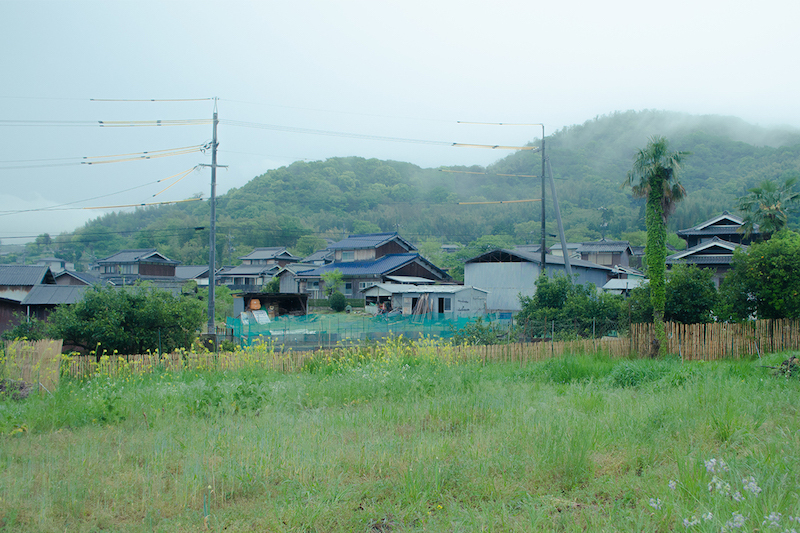 Nishino-san’s “Momoshima Furusato（Home）Farm” was named as such because he wanted it to be a place that feels like home. He apparently did all the carpentry work himself. 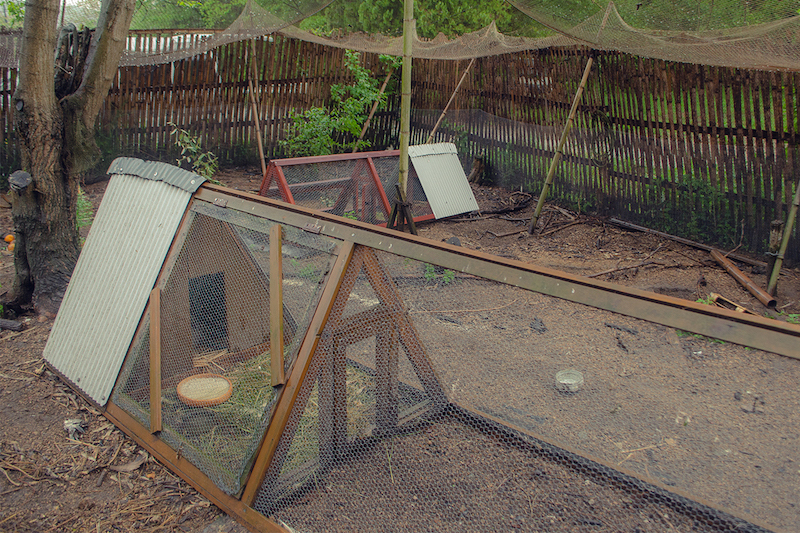 He gathered bamboo from the mountains and connected them one-by-one to make a fence wrapping around the farm, and even made the triangular coops himself, too. It’s a beautiful model of life amidst nature. The field he took me to after the chickens were taken care of was spectacle of bushy grass that made me wonder where it was. Once he started a weekly morning market in order to circulate the things of the island around it, Nishino-san found that the isle’s inhabitants rushed to get there first each time. That night he treated me to some of the chicken he had slaughtered earlier. On this island both the people and the food live by their own abilities. They exist quietly, spreading strong roots. I reluctantly returned to the port, thinking that I wanted to meet more of the people of the island, that I wanted to try living there. I’m sure the people of the island can spot someone not from there at first glance. I had several people ask me what brought me there. Their innocent smiles filled me with happiness. It was a short trip from Fushimicho. What awaited just over an hour away was a jaunt with an entirely different flow of time. I would be back. Though I had barely set foot outside of Fukuyama, it was a deep trip. 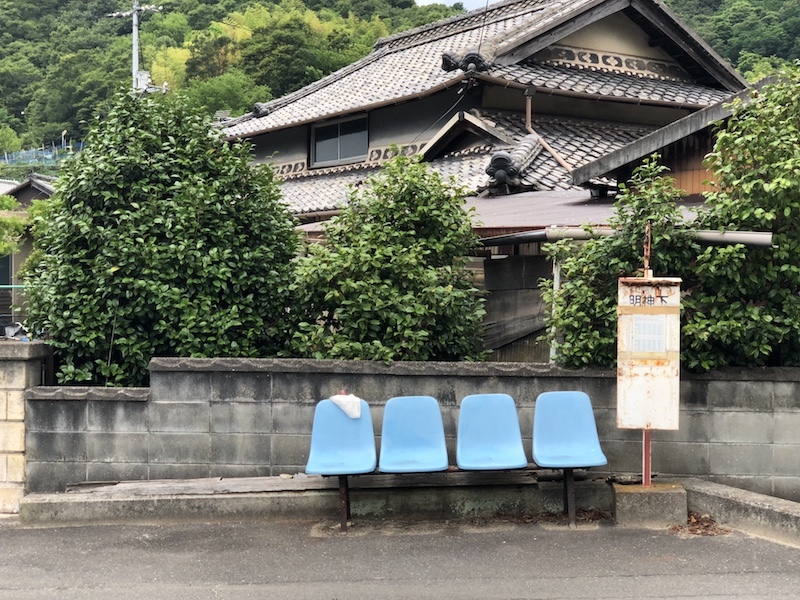 I imagine there are still other islands out there with scenes of life I won’t find anywhere else and people I’ll want to see again just a boat ride out from Fukuyama. ●You can use the parking area in front of the wharf. The parking space is small, so there are times where it can’t be used. ●Automobiles can be ferried at Tsuneishi Harbor. 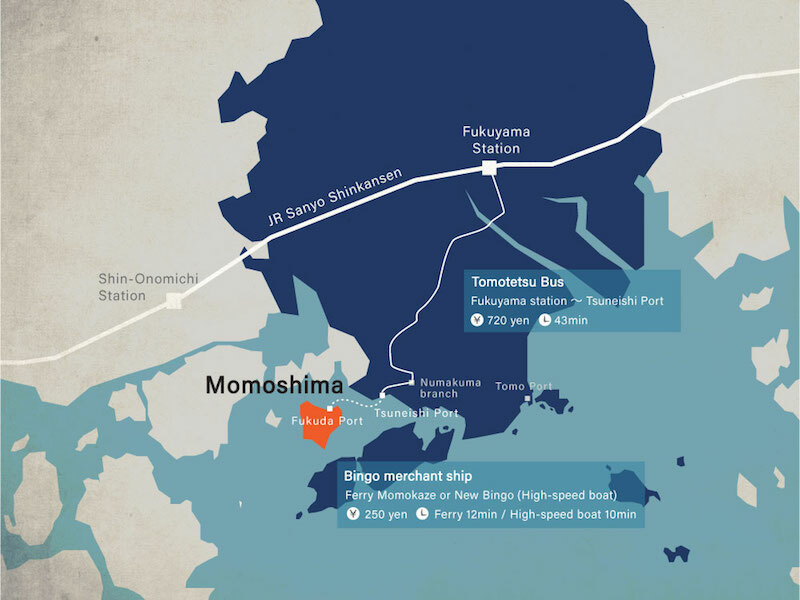 ●There are only three harbors that can transport automobiles: Uta Harbor, Tsuneishi Harbor, and Fukuda Harbor. Automobiles can be transported on both the ferries and high-speed boats.